A reader pointed us to a forum discussion at a website called CycleChat.net regarding infrastructure for bicycles. A poster on the forum named Tommi published a post about the positive aspects of implementing bicycle infrastructure. He did so, we gather, as a counter to the tiresome rants of members of cycling's secret sect who continue to oppose infrastructure for bicycles because it interferes with their testosterone thrill of 'running with the bulls'. 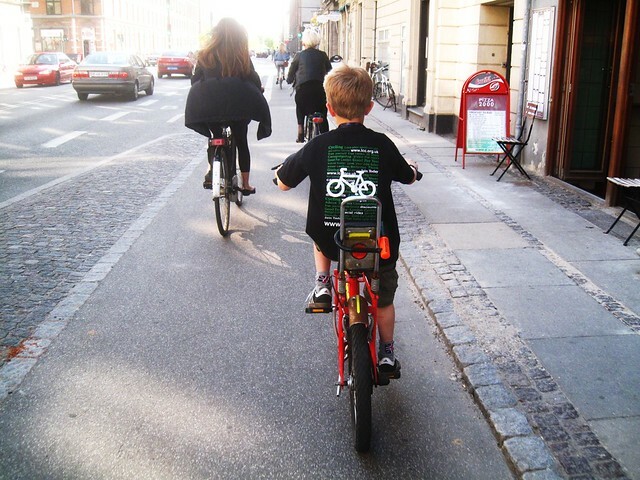 We thought it highly appropriate to republish Tommi's search results here on Copenhagenize.com. They deserve a wider audience. This is on the same day that David Suzuki published this piece calling for infrastructure. Much of the rest of the world including quite a bunch of (presumably) smart people seem to have come to the conclusion cycle lanes and cycle tracks are very much worth every penny. Comparing the credibility between the camps I can't say I'm surprised. I firmly believe separated infrastructure is a fundamental part of a functional cycling environment and there's plenty of research to support that theory. But if cycle lanes and cycle tracks really are as useless and dangerous as some try to claim then you should have no trouble proving with abundant research how omitting infrastructure leads to even more and safer cycling. I'm looking forward to the research proving how the rest of the world is wrong. Sweden: "In mixed traffic, the risk per cyclist seemed to decrease with an increased number of cyclists; on a cycle track, the risk seemed independent of the bicycle volume. However, for left-turning cyclists, the picture was totally different; cyclists on the carriageway face a 4 times higher accident risk than cyclists on separate cycle tracks. Linderholm finally suggested that cyclists should be moved onto the carriageway some 30 metres before the intersection, but that if left-turning cyclists exceeded 20 per cent of cyclists going straight ahead, it was preferable to build a cycle track across the intersection." Denmark, improved cycle track design: "At all junctions, the number of serious conflicts was reduced from the before to the after period. Behavioural studies showed that the modified junctions had changed the interaction between cyclists and motorists in a way that appeared to promote traffic safety." Two-way cycle tracks: "Ekman and Kronborg (1995) produced a report based on an international literature review, and interviews with experts from Denmark, Finland, the Netherlands, Norway, and Sweden. The conclusion was that one bi-directional cycle track was cheaper to build than two one-way tracks, one on each side of the road, but that bi-directional tracks were, however, less safe for cyclists, since it made merging with car traffic before the stop line at a junction impossible." Denmark: "They concluded that cycle lanes and cycle tracks were safer than no cycle facilities between junctions. There were however problems with parked cars on cycle lanes. It was recommended that separate cycle tracks should be built on road links when the volume of motorised traffic was high and when speeds were also high." Denmark: "ensure acceptable safety levels: This is best achieved by constructing, wherever possible, segregated paths, designed in such a way as to encourage their use by cyclists." Anon, 1998. Safety of vulnerable road users. In PROGRAMME OF CO-OPERATION IN THE FIELD OF RESEARCH ON ROAD TRANSPORT AND INTERMODAL LINKAGES. OECD, pp. 1-229. "High quality, integrated bicycle routes (on and off road) should be provided to meet the challenge of increasing Australia’s participation in active travel and recreation." Bauman, A. et al., 2008. Cycling: Getting Australia Moving: Barriers, Facilitators and Interventions to Get More Australian Physically Active Through Cycling, Dept. of Health and Ageing. Costa Rica: "new infrastructure is being put in place to protect vulnerable road users, including [...] cycle tracks" "The creation of networks of connected and convenient pedestrian and cyclist routes, together with the provision of public transport, can lead to greater safety for vulnerable road users. The routes will typically consist of footpaths or cycle paths separate from any carriageway, pedestrian-only areas with or without cyclists being admitted, footpaths or cycle tracks alongside carriageways, and carriageways or other surfaces shared with motor vehicles." Denmark: "Bicycle paths have also been shown to be effective in reducing crashes, particularly at junctions. Danish studies have found reductions of 35% in cyclist casualties on particular routes, following the construction of cycle tracks or lanes alongside urban roads." Cameron, M., 2004. World Report on Road Traffic Injury Prevention. Injury Prevention, 10(4), pp.255-256. "This review has shown that cost-benefit analyses of cycling and walking infrastructure generally produce positive benefit-cost ratios (BCRs). Although these should be treated with caution due to the diverse methods used, it can be concluded that eight authors produced sixteen benefit-cost BCRs for various cycling/walking projects, and only one was negative (Figure 1). The BCRs were also of an impressive magnitude: the median BCR was 5:1, which is far higher than BCRs that are routinely used in transport infrastructure planning." Cavill, N. et al., 2008. Economic analyses of transport infrastructure and policies including health effects related to cycling and walking: A systematic review. Transport Policy, 15(5), pp.291-304. "The available research results indicate that roundabouts with separated cycle lanes are safer than roundabouts with mixed traffic or roundabouts with adjacent cycle lanes." Daniels, S. &amp;amp; Wets, G., 2005. Traffic Safety Effects of Roundabouts: A review with emphasis on bicyclist’s safety. In 18th ICTCT workshop. pp. 1-12. "This review assesses the evidence base from both peer reviewed and grey literature both in the UK and beyond. Almost all of the studies identified report economic benefits of walking and cycling interventions which are highly significant. The median result for all data identified is 13:1 and for UK data alone the median figure is higher, at 19:1." Davis, A., 2010. Value for Money: An Economic Assessment of Investment in Walking and Cycling, Department of Health South West. "The first part of that environment is bicycle infrastructure that addresses people’s concern about safety from motor vehicles. In Portland, this includes a network of bike lanes, paths, and boulevards." "Finally, the role of bike lanes should not be dismissed in planning for a bicycle-friendly community. A disproportionate share of the bicycling occurs on streets with bike lanes, indicating their value to bicyclists." Dill, J., 2009. Bicycling for transportation and health: the role of infrastructure. Journal of public health policy, 30 Suppl 1(1), pp.S95-110. "Higher levels of bicycle infrastructure are positively and significantly correlated with higher rates of bicycle commuting." Dill, J. &amp;amp; Carr, T., 2003. Bicycle Commuting and Facilities in Major U.S. Cities: If You Build Them, Commuters Will Use Them. Board, National Research Council, Washington, DC, 1828(1), pp.116-123. "The estimated change in demand is relatively small: an increase in persons cycling from 11.6% to 14.2% (strict level) and to 20.9% (tolerant level) for all the regular trips, and from 6.0% to 8.3% and to 14.3%, respectively, for commuting." Foltýnová, H. &amp;amp; Braun Kohlová, M., 2007. COST-BENEFIT ANALYSIS OF CYCLING INFRASTRUCTURE : A CASE STUDY OF PILSEN. "Improved cycling infrastructure in the form of bicycle paths and lanes that provide a high degree of separation from motor traffic is likely to be important for increasing transportation cycling amongst under-represented population groups such as women." Garrard, J., Rose, G. &amp;amp; Lo, S.K., 2008. Promoting transportation cycling for women: the role of bicycle infrastructure. Preventive Medicine, 46(1), pp.55-59. "The assumptions in this analysis suggest that the basic plan will benefit most strongly from earlier investments that built the base for a functioning network of bicycle facilities, yielding roughly 4 times the amount of bicycle miles traveled per invested dollar, compared with past investments. The 80% plan yields about twice as much"
Gotschi, T., 2011. Costs and benefits of bicycling investments in Portland, Oregon. Journal of physical activity &amp;amp; health, 8 Suppl 1(Suppl 1), pp.S49-58. "Overall, there is internal consistency in the changes of safety and traffic volumes, which indicate causality, and the causal direction seems clear." "The magnitude of the changes in traffic volumes on the reconstructed streets, and the traffic volumes on parallel streets, however, do indicate that thousands of travelers in total must have changed their choice of transport mode." "The construction of bicycle tracks resulted in a 20 percent increase in bicycle/moped traffic mileage and a decrease of 10 percent in motor vehicle traffic mileage on those roads, where bicycle tracks have been constructed." Jensen, S.U., 2008. Bicycle tracks and lanes: A before-after study. Transportation Research Board 87th, (August). "The conclusion is that the safety benefit of cycle lanes are very good except at some priority junctions located alongside the cycle lane. This study therefore show that focus shall be put on the priority junctions when establishing cycle lanes. The Danish Road Directorate have as a result of that started a new project with main emphasis on cyclist safety at priority junctions." Jensen, S.U., Andersen, K.V. &amp;amp; Nielsen, E.D., 1997. Junctions and cyclists. In Velo-City. Barcelona, pp. 275-278. "The construction of cycle tracks in Copenhagen has resulted in an increase in cycle traffic of 18-20%"
"Taken in combination, the cycle tracks and lanes which have been constructed have had positive results as far as traffic volumes and feelings of security go. They have however, had negative effects on road safety. The radical effects on traffic volumes resulting from the construction of cycle tracks will undoubtedly result in gains in health from increased physical activity. These gains are much, much greater than the losses in health resulting from a slight decline in road safety." "The cycle tracks (kerb between drive lane and cycle track, and kerb between sidewalk and cycle track) increase cycling by 18-20%, whereas cycle lanes (only a 30 cm wide white marking to drive lane) increase cycling by 5-7%"
"I do know that it will lead to better safety for the bicyclists." "While the bike lanes do not seem to have an effect one way or the other, if someone tried to use Soren’s study to “prove” that an increase in cycle tracks increased accidents by 9%, they’d be guilty of cherry picking the numbers. The accident rate may have increased by 9%, but the number of bicyclists increased by 18-20%." "To to sum up, individual accident rates dropped when bicycle infrastructure was added, and taking that a step further, Soren’s follow-up correspondence recommends that if Dallas added cycle tracks, ridership would be “much higher”, and “that it will lead to better safety for the bicyclists.” He even recommends maintaining parking on streets to further decrease accident rates." Jensen, S.U., Rosenkilde, C. &amp;amp; Jensen, N., 2007. Road safety and perceived risk of cycle facilities in Copenhagen. Presentation to AGM of European Cyclists Federation, pp.1-9. "Consequently, in most cities with cycling facilities, there are many discontinuities where the path or lane simply ends abruptly. These discontinuities are partly the result of a logical inversion: it has long been standard practice to consider existing road infrastructure as the main network for cycling and the cycling facilities as the supplement to avoid conflicts. Rather, creating a complete network of cycling facilities where they are needed, supplemented by “shared streets” where they are not, should become the standard." Larsen, J. &amp;amp; El-Geneidy, A., 2010. Build it, but where? The Use of Geographic Information Systems in Identifying Optimal Location for New Cycling Infrastructure. In Transportation Research Board 89th Annual Meeting. p. 16. • Individuals, in particular women, children, and seniors, prefer to bicycle separated from motor traffic. • Cycle tracks (physically-separated bicycle-exclusive paths along roads) exist and continue to be built in The Netherlands where 27% of all trips are by bicycle and 55% of bicycle riders are female. • Engineering guidance in the United States has discouraged bicycle facilities that resemble cycle tracks, including parallel sidepaths and sidewalk bikeways, suggesting that these facilities and cycle tracks are more dangerous than bicycling in the street. • Overall, 2 ½ times as many cyclists rode on the cycle tracks compared with the reference streets. • There were 8.5 injuries and 10.5 crashes per million-bicycle kilometers respectively on cycle tracks compared to published injury rates ranging from 3.75 to 67 for bicycling on streets. The relative risk of injury on the cycle track was 0.72 (95% CI=0,60-0.85) compared with bicycling in the reference streets. • Cycle tracks lessen, or at least do not increase, crash and injury rates compared to bicycling in the street. Lusk, A.C. et al., 2011. Risk of injury for bicycling on cycle tracks versus in the street. Injury prevention journal of the International Society for Child and Adolescent Injury Prevention, 17(2), pp.131-135. "The average number of bicycle crashes a year within the 2.5 km buffer of the Phase-1 of the Midtown Greenway from 1998-2000 was 78.33 crashes a year with a standard deviation of 8.33. In each of the two years after the opening of the Phase-1 of the Midtown Greenway, there were 50 bicycle crashes within the buffer. This is a statistically significant decrease in the number of crashes." "Although the transferability of the results of this study to other off-street bicycle facilities may be limited, it does present a methodology that can be used to measure the effect of building a bicycle facility on the safety of bicycling in the area. Questions remain about the safety of off-street bicycle facilities that force bicyclists to cross streets." "Within the United States, Davis, California is generally recognized as having the most elaborate system of cycling facilities of any American city. It also has, by far, the highest bicycling modal split share (22%), and a very low fatality and accident rate, among the lowest in California. If Forester were correct that separate facilities are so dangerous, one would certainly expect Davis to be overwhelmed by all the resulting bicycling injuries and deaths. Yet cycling in Davis is extraordinarily safe. In short, those countries and cities with extensive bicycling facilities have the highest cycling modal split shares and the lowest fatality rates. Those countries and cities without separate facilities have low modal split shares and much higher fatality rates. Forester claims that this is pure correlation and proves nothing. Nevertheless, the differences we have cited are dramatic—indeed, an order of magnitude or greater—and they directly contradict Forester’s claim that separate facilities are so unsafe and inconvenient." Pucher, J., 2001. Cycling Safety on Bikeways vs . Roads. Transportation Quarterly, 55(4), pp.9-11. "The infrastructure, programs, and policies needed to increase walking and cycling are well known and tested, with decades of successful experience in many European cities. One key lesson is that no single strategy is sufficient. As shown by a recent international review of the literature, communities must implement a fully integrated package of measures such as those discussed previously in this paper (Pucher et al., 2010). A comprehensive approach has much greater impact on walking and cycling levels than individual measures that are not coordinated. The impact of any particular measure is enhanced by the synergies with complementary measures in the same package." Considering cycle lanes are waste of money and cycle tracks are inherently dangerous you should have no problem pointing out another report of comparable research that shows leaving out cycle lanes and cycle tracks would have resulted much more significant results. Pucher, J. &amp;amp; Buehler, R., 2010. Walking and Cycling for Healthy Cities. Built Environment, 36(4), pp.391-414. "The success of Portland is important because it shows that even car-dependent American cities can greatly increase cycling by implementing the right package of infrastructure, programs, and policies." Pucher, J., Buehler, R. &amp;amp; Seinen, M., 2011. Bicycling renaissance in North America? An update and re-appraisal of cycling trends and policies. Transportation Research Part A: Policy and Practice, 45(6), pp.451-475. "Before-and-after counts in several North American cities and London (UK) show increases in number of cyclists after bike lanes installed." Off-street paths: "Two studies showed an increase in the number of cyclists"
"Stated preference studies almost uniformly found that both cyclists and non-cyclists preferred having bike lanes to riding in mixed traffic. The findings from the studies of off-street paths were varied, with some showing positive associations and others showing no statistically significant relationship. Only four studies examined bicycle boulevards and traffic-protected cycletracks, types of roadway infrastructure less common in the US. The findings generally showed a positive association between these facilities and bicycling, though without good estimates of the quantitative effects on actual bicycling rates." Pucher, J., Dill, J. &amp;amp; Handy, S., 2010. Infrastructure, programs, and policies to increase bicycling: an international review. Preventive Medicine, 50 Suppl 1(1), p.S106-S125. "The evidence to date suggests that purpose-built bicycle- only facilities (e.g. bike routes, bike lanes, bike paths, cycle tracks at roundabouts) reduce the risk of crashes and injuries compared to cycling on-road with traffic or off-road with pedestrians." Reynolds, C.C. et al., 2009. The impact of transportation infrastructure on bicycling injuries and crashes: a review of the literature. Environmental health a global access science source, 8(1). "Walking and biking remain attractive transport modes for a number of reasons: - biking and walking infrastructure usually have a very high spatial penetration"
Rietveld, P., 2001. Biking and Walking: The Position of Non- Transport Systems Motorised in Transport Systems. Rissel, C.E., 2009. Active travel: a climate change mitigation strategy with co-benefits for health. New South Wales public health bulletin, 20(1-2), pp.10-13. The CBAs presented are based on high, though realistic cost estimates, and ‘‘low’’ benefit estimates in order to prevent overestimates. The analyses are therefore judged to produce ‘‘down-to-earth’’, conservative estimates of the profitability to society of building walking and cycling track networks in Norwegian cities. (a) Best estimates of future pedestrian and bicycle traffic leave no doubt that building walking and cycling track networks in Hokksund, Hamar and Trondheim is beneficial to society. Net benefit/cost ratios in these cities are approximately 4, 14 and 3, respectively. Sælensminde, K., 2004. Cost-benefit analyses of walking and cycling track networks taking into account insecurity, health effects and external costs of motorized traffic. Transportation Research Part A: Policy and Practice, 38(8), pp.593-606. "Infrastructure (e.g. cycleways and cycle [t]racks) is an essential ingredient for improving bicycle use and cyclists’ safety. Well-planned and well-kept infrastructure (through design, maintenance and adequate connectivity) encourages cycling and reduces road accidents." Vandenbulcke, G. et al., 2009. Cycle commuting in Belgium : Spatial determinants and ’ re-cycling ' strategies. "It was found that the bicycle network plan resulted in a significant increase in bicycle use and in improved cycling conditions." "Cycling comfort and safety clearly improved"
Wilmink, A. &amp;amp; Hartman, J., 1987. Evaluation of the Delft Bicycle Network Plan, Delft. "The benefits of facilities for pedestrians and cyclists exceed costs by a wide margin." 1. A separate network of direct routes for pedestrians and a separate network of direct routes for cyclists." - creating a network of main traffic routes for pedestrians and cyclists,"
"The three year Danish National Cycle City project aimed to increase cycling in Odense between 1999 and 2002 through a multifaceted approach that included promotional campaigns and infrastructural measures. A controlled repeat cross sectional study comparing national travel survey data collected in Odense and in nearby towns and cities between 1996-97 and 2002 found an increase in the proportion of all trips made by bicycle in Odense from 22.5% to 24.6% (equating to an estimated net increase of 3.4 percentage points after adjustment for regional trends) and a net increase in the distance cycled of 100 metres per person per day." "The Cycling Demonstration Towns programme in England involved various combinations of town-wide media campaigns, personalised travel planning, cycle repair and cycle training services, and improvements to infrastructure for cycling. The effect of the first phase comprising six towns (2005 to 2008) was examined in a controlled repeat cross sectional study based on telephone surveys of quota samples of local residents. Net increases were found in the proportions of residents who reported cycling for at least 30 minutes once per month (+2.78% or +1.89%, depending on the choice of control areas) or 12 or more times per month (+0.97% or +1.65%)." Yang, L. et al., 2010. Interventions to promote cycling: systematic review. Bmj Clinical Research Ed., 341(c5293). This is in no way a complete list. But it's a fine start.